I could little have anticipated that just a few weeks after driving the six hundred or so miles back from Mull I’d be heading North of the border once more. But here I am, in a cottage just East of Edinburgh, contemplating the tragic loss of a family member who was taken from us far too soon. With the funeral taking place in a couple of days there is much to be sad about, but at the same time I feel the greatest respect I can pay is to continue with his love of nature and try not to regret that we never had the chance to explore it more fully together. To that end we will be spending the next week walking and birding an area of the country which neither of us know all that well, walking in his footsteps and wondering about what conversations we might have shared had things worked out differently. Our mammoth drive from Swansea to Edinburgh began last night where, upon leaving Wales, we had no idea quite what the weather Gods had in store for us. The mild and wet conditions which have, not to put too fine a point on it, plagued us since the beginning of November suddenly and quite dramatically gave way. In their place came a bitingly cold wind accompanied by rain, sleet and finally blizzards which made driving considerably more attention sapping than usual. 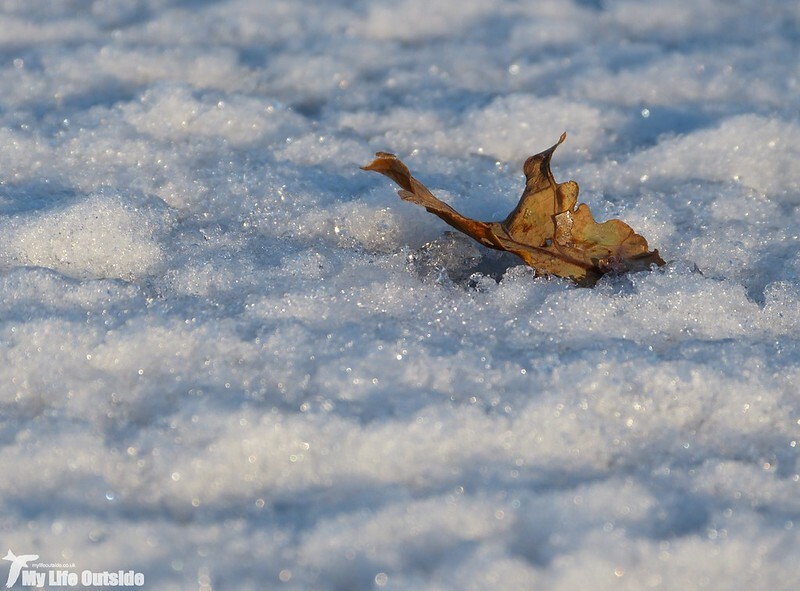 There is, after all, only so long you can pretend that the snowflakes rushing towards you are reminiscent of the Millennium Falcon making the jump into hyperspace. But I digress. Needless to say that after a good night's sleep at a Travelodge on the M6 we awoke this morning to a light covering of snow. Nothing to get too excited about you understand but after a distinct lack of the white stuff over the past couple of winters I couldn’t help cracking a little smile. The only minor concern was that the car park was an ice rink, we had no idea what the motorway would be like and there was still another couple of hours travelling ahead of us before Edinburgh. As it turned out we needn’t have worried as the M6 was clear even if the on and off ramps were anything but. Still, nothing like an early morning slide to make sure you’re awake. The one downside was that our plan to take the scenic route across the hills had to be abandoned but even the more direct, supposedly trunk road had snow down its middle for mile after mile. The scenery was stunning (no photos sorry as I couldn’t stop) and we managed to get the trips bird list off to a good start with Cormorant, Lapwing, Jay, Greylag Goose, Rook and Buzzard all seen from the car. Crows were alas not of the Hooded variety (too far South) but there were a couple of Highland Cows which kept Emma happy. When Edinburgh finally hove into view the snow had gone and I was confronted with my first ever view of the Firth of Forth. 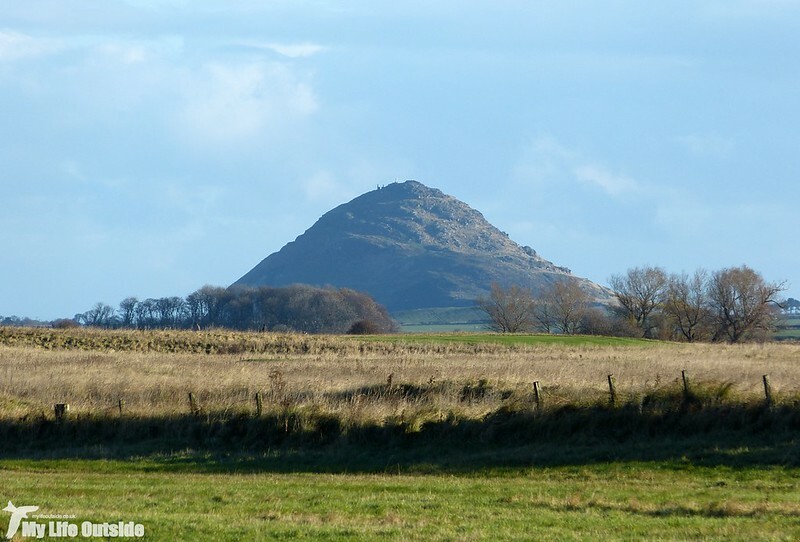 I liked what I saw, especially the steeply sided hill which stood out, isolated, against the surrounding lowlands. Little did I realise quite how close it would be to our cottage and upon driving past we just had to stop and climb right to the top. From there the panoramic views were truly spectacular as I surveyed a landscape quite unlike anywhere I’ve ever seen before. 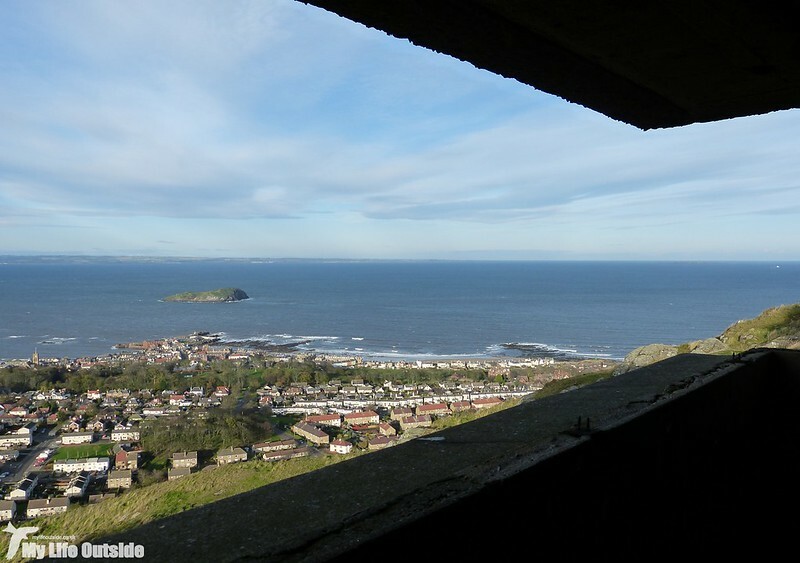 There’s not many places for instance that include oil rigs, lighthouses, castles, WW2 radar stations and the single biggest Gannet colony in the world, all in the same sweeping view. Even the best bits of Wales would struggle to match that! 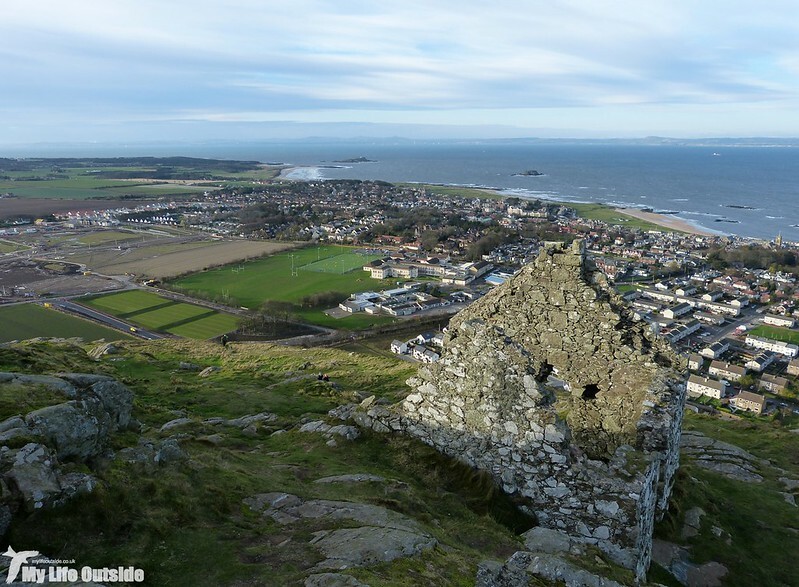 It’s only following a little bit of research that I now know the hill to be North Berwick Law, a glacially weathered volcanic plug standing some 187 meters above sea level. It’s distinctive conical shape is typical of these formations but I’ve seldom seen one quite so pronounced against the surrounding landscape. 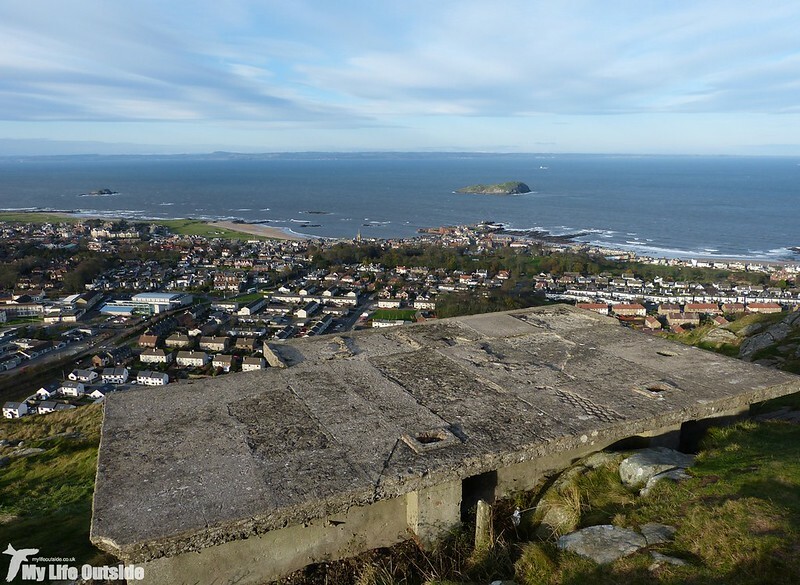 Perhaps unsurprisingly people have been making use of this site for hundreds of years with an Iron age hill fort on top and lookout positions dating from both the Napoleonic and Second World Wars. It was the second of these structures which offered the best protection from a bitingly cold wind (seriously, it was absolutely freezing and I’m only just warming up now) allowing more time to soak up these expansive views. 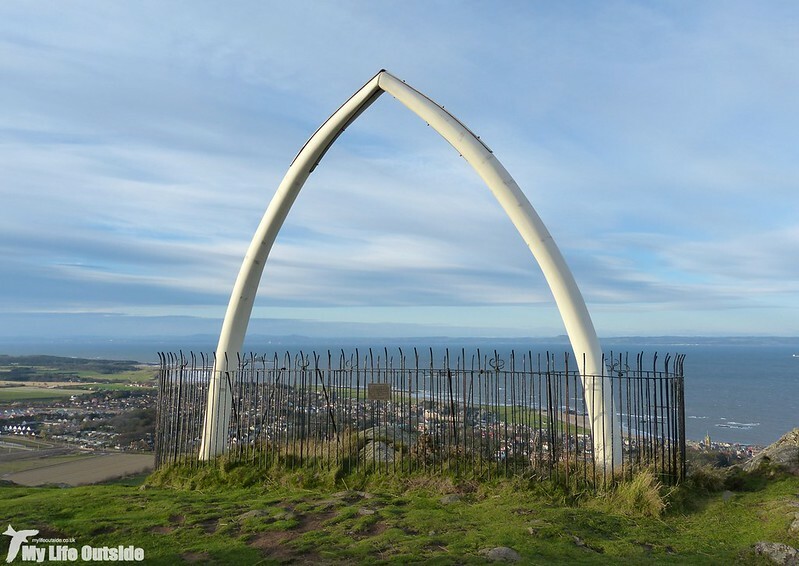 More surprising in terms of “things you’d expect to find on top of a hill” was the fibreglass replica of a whale bone donated by a supposedly anonymous friend of the town. 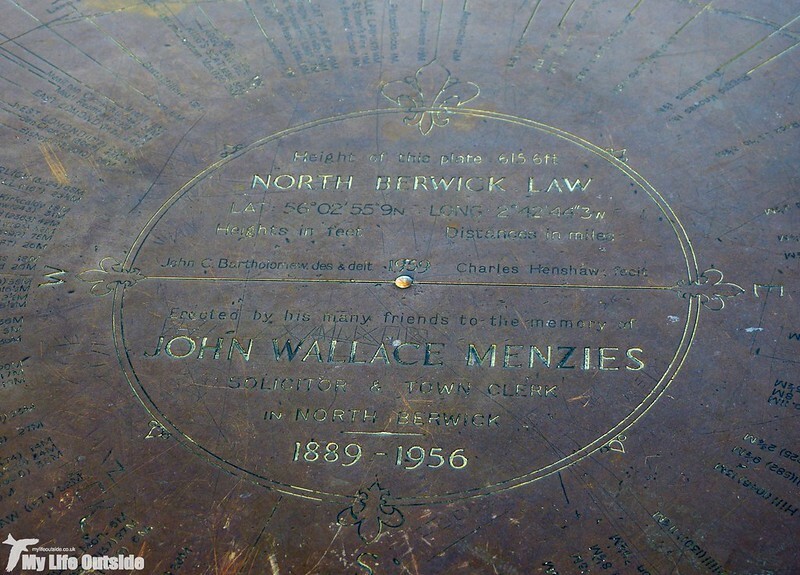 This replaced the original, actual whalebone which collapsed due to deteriorating condition in 2005. Fake or real it certainly made for a memorable sight. 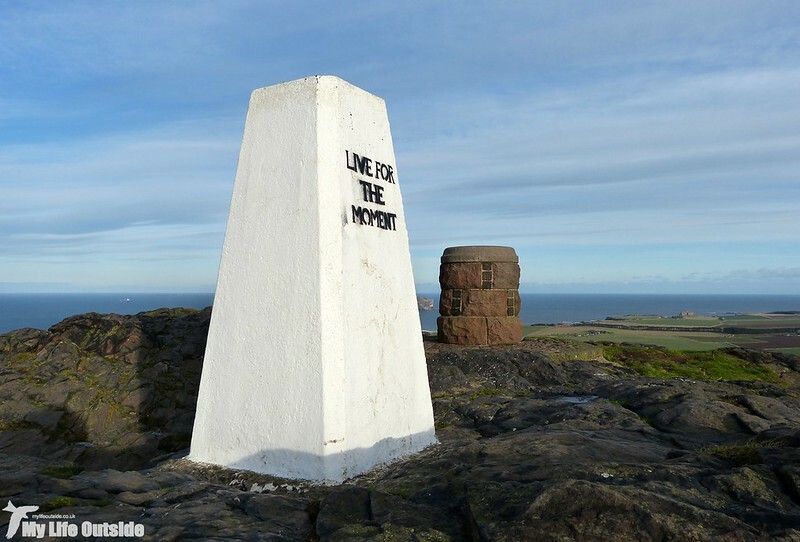 Of course any self respecting landmark such as this would not be complete without a trig point at its summit and I’m happy to report that North Berwick Law scored top marks in that respect, A perfectly maintained pillar of white stood side by side with a bronze plaque marking the key landmarks. Someone had even added their own motto, not something I normally approve of, but given the circumstances in which we find ourselves here, more than a little apt. 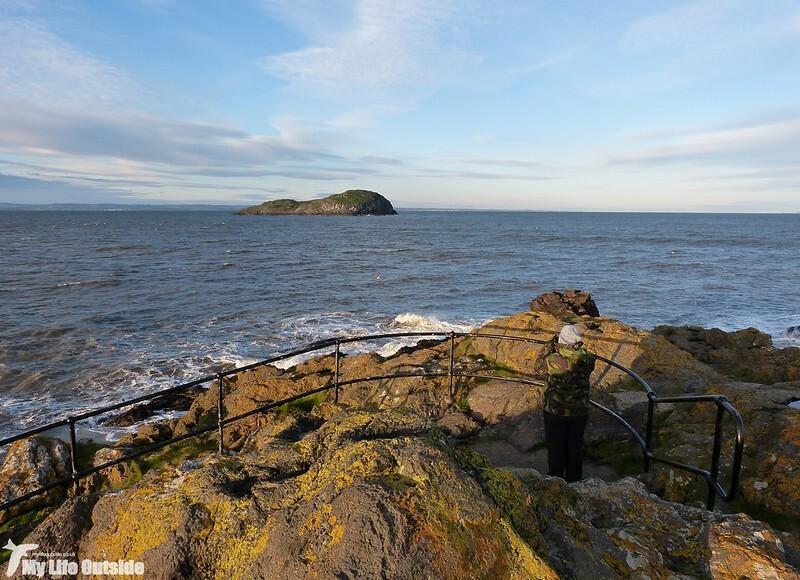 Even though it was only mid-afternoon the sun was already well on its way to the horizon at this point so we retraced our steps and headed for North Berwick itself. 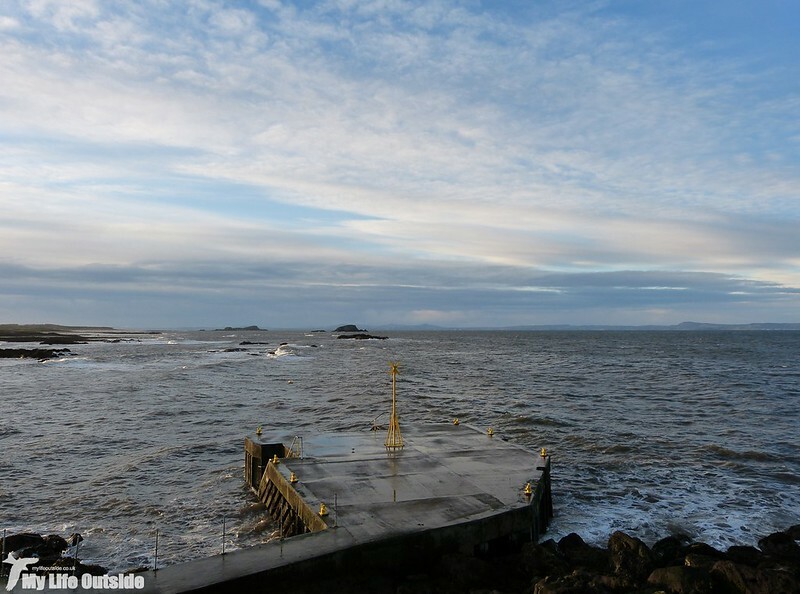 The old harbour there is home to the Scottish Seabird Centre which we took to meaning that there should probably be some decent birds about. Consider that understatement of the year. Straight off the bat we were watching Turnstones, Redshanks (including one individual with such fluorescent legs that it looked positively fake), Oystercatchers and a Grey Heron which dropped in to feed amongst the rock pools just ahead of us. Then Emma called out that she had something on the water and I quickly picked up a pair of Eiders, male and female, just offshore. Both looked to be in peak condition with the female in particular appearing more rufous than usual. The only thing was that Emma was absolutely convinced that she’d seen a Long-tailed Duck but, when the mystery bird did reappear, it was only for the briefest of moments lending no clue as to its identity. There wasn’t time to ponder for long however as a flock of six passing auks necessitated a quick change in focus. Though distant they didn’t look like either Razorbills or Guillemots and our thoughts naturally leant towards Little Auks. Plumage looked right as did shape and build. In fact the only reason I’m not shouting from the rooftops is that it’s a species I’ve only ever seen once before, in Norfolk, and I can’t quite bring myself to believe that we could have been so lucky. 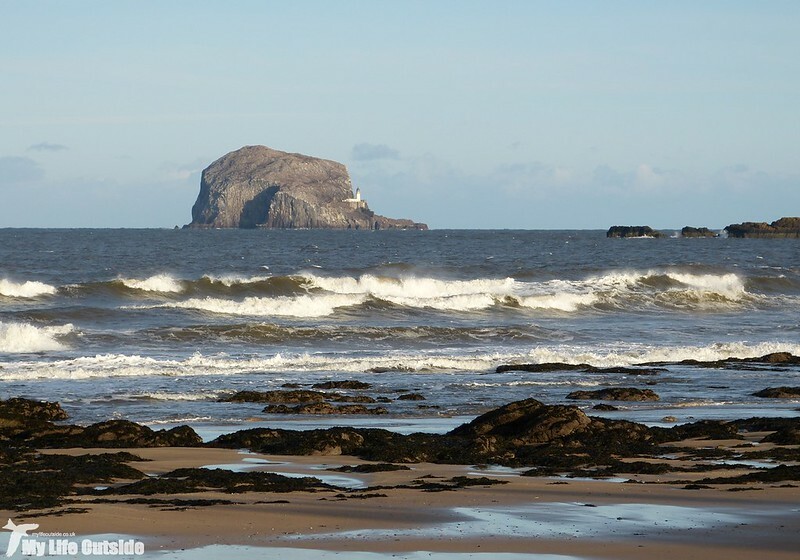 Once again the scenery was proving truly spectacular with the shallow sweep of the beach leading the eye naturally to Bass Rock (below). This volcanic island, quiet at this time of year, is in spring and summer home to over 150,000 Gannets. What a spectacle that must make but today we had to settle for rolling waves and sheer cliffs. I may have to come back here. Over at the harbour a narrow walkway takes you out to the end of a rocky outcrop where we hit lucky in relocating Emma’s supposed Long-tailed Duck. Though still distant we managed to confirm her earlier suspicions in the shape of a fantastic male which despite all my wishing never did approach any closer. The same can’t be said of the Peregrine Falcon which first flushed the gathered waders before heading off with prey firmly clenched in talons. 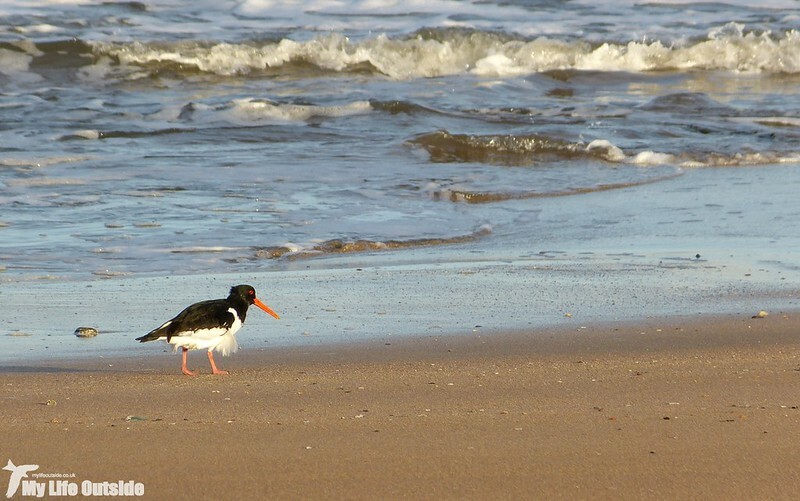 There was even a pair of Red-breasted Mergansers just off the beach. What a place. We finished the day by driving a little of the coast road and added yet more destinations to an itinerary which is already fit to bursting. And that was before we’d heard reports of a roosting trio of Long-eared Owls just down the road from our cottage. You can probably imagine where we’ll be heading first thing tomorrow. Thanks Stewart it's certainly a possibility. My only Little Auk encounter to date was in Norfolk and these birds did look larger especially given their relative distance. Their flight also wasn't as you described being steady and well above the waves. Could be Razorbills after all then. What a beautiful spot! Very sorry for your loss. How true we must live for the moment.